Sprint iPhone 7 & 7 plus NOT compatible with Verizon? So I have an unlocked 7+ from the upgrade program and, after 20+ years of horrible signal at home with Sprint, decided to switch to Verizon. I was shocked to be told by Verizon that currently they are not able to connect Sprint iPhone 7/7+'s due to an incompatibility issue. I told the rep that they are the same radios and he said there is something in the Sprint version that is giving them trouble connecting? He also said that the 6 and 6S wasn't a problem just the 7's. He spoke to his supervisor and said they are hoping to resolve this soon and took my number to call me when the problem was solved. Has anyone successfully switched from Sprint to Verizon with a 7 or 7+? I thought the Sprint and Verizon 7/7+'s were identical? Am I missing something? Last edited by blackcats; 11-13-2016 at 09:22 AM. My understanding is the iPhone 7 from Verizon and Sprint is compatible with Verizon, Sprint, T-Mobile, and AT&T. All you need is an active SIM card from Verizon. Pop it in, and you're good to go. Not Quite Right and Spencerdl like this. There are many others they may have already said the said the same thing. Since the iPhone 5S, Apple has been producing a single device with all of the radios in them. They were making a stance they would no longer make multiple variations for specific carriers. As a former telecom employee, I know this to be a fact. A few other manufacturers has done the same thing, like Nexus 5X & 6P. I think with the newer generation phones and current tech, most- to all phone companies are trying to monopolize their phones in each phone carrier. Like, Apple knows people are inclined to switch from Sprint to Verizon, and they want to stop that because they could be selling more iPhones than people transferring carriers. They can sell more iPhones that way. If you might not have noticed yet, Apple is only there for the money. More than likely, they just wanted a phone sale. This is a screenshot from the back of my Jet Black 7 Plus iPhone Box. Nothing about specific carriers. Yep, the Verizon rep was either misinformed or BSing you. My AT&T iPhone 5S, while unlocked for any GSM networks, doesn't have an MEID or any way to activate on a CDMA 2000 network. This is despite having exact same and full hardware of every other iPhone 5S. The iPhone 6 and 6S will work on any network, CDMA 2000 included, as long as it is paid off in full and not under any obligation to it's original carrier. Have you tried putting a Verizon sim in the phone? Find a friend with Verizon and give it a shot. I bet it works. Spencerdl and Rob Phillips like this. Yup. My unlocked iPhone 5S is not compatible with Verizon. With a Verizon SIM, I get a pop up "waiting for activation", then to call a number (Verizon customer care) to activate and then I am told my phone can't be activated. When I go to the Verizon "Bring your own device" website and put in my IMEI, I am told my device is not compatible. When I go to settings/about, there is no MEID. It has nothing to do with A SIM card. The SIM card on the iPhone 5S for Verizon is only for LTE. The iPhone 5S doesn't do VoLTE. My iPhone 5S can't be activated to Verizon. The CDMA 2000 radio is not even enabled on it. There is no ESN or MEID. Not even on the box. Last edited by scruffypig; 11-14-2016 at 09:40 AM. I was asking about the 7. The 5s is a different beast. The 7 should work. Helps if you use the handy quote feature. Cheers! Last edited by Rmorton0573; 11-18-2016 at 12:23 AM. OptiPrime and nikkisharif like this. 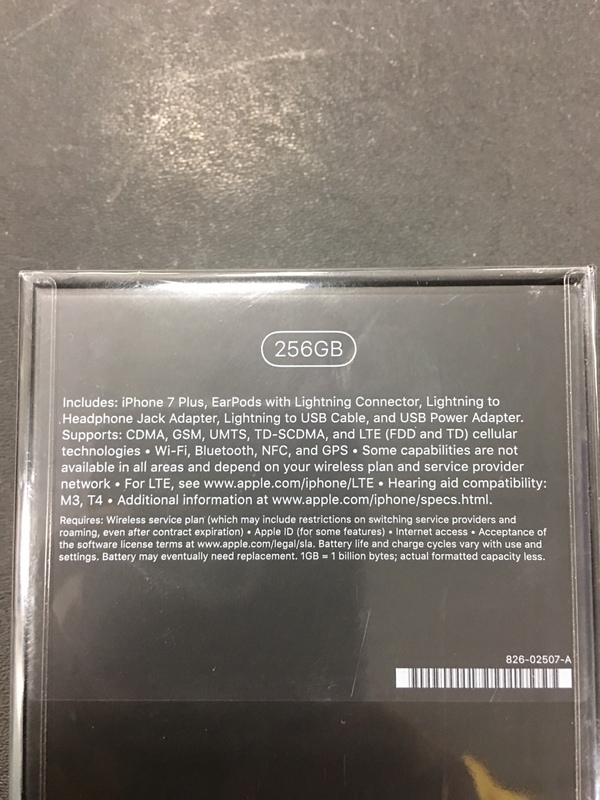 If the customer bought his iPhone 7/7+ from Apple as part of the iPhone Upgrade Program, to use on Sprint, it is not the "Sprint" model which is carrier locked to Sprint until paid off. There is no payment obligation to Sprint for the iPhone. The iPhone model would be the same as the SIM free model. 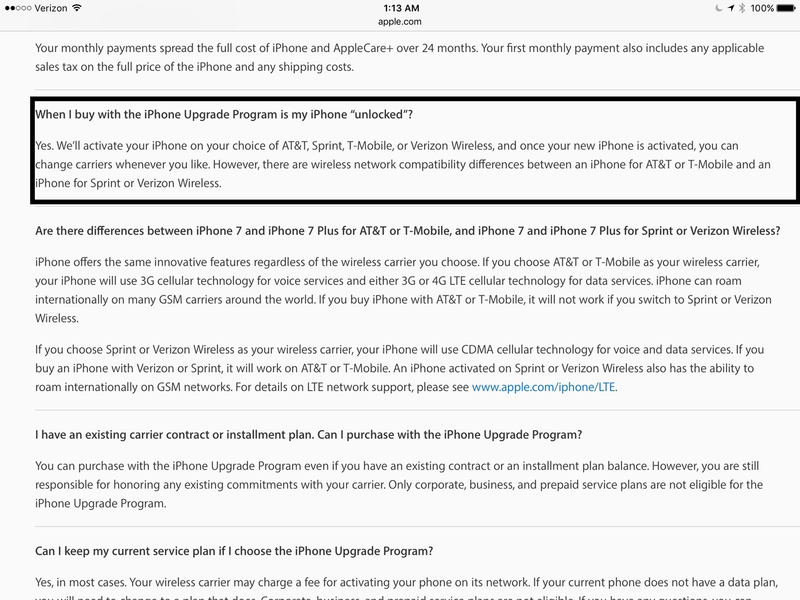 Apple doesn't care who you use your iPhone with for a iPhone bought with the iPhone Upgrade Program. They only have you make a selection as to one of the big four carries, for convenience and some phone companies make you sign a contract for cell service. Last edited by scruffypig; 11-18-2016 at 07:44 AM. Rmorton0573 and eyecrispy like this. Lol. Maybe he will learn to appreciate your wisdom more now. TheRewardisCheese and nikkisharif like this. I have an iPhone 7 from the Apple Store on the iPhone Upgrade Plan currently on Sprint. The Verizon IMEI check page says my phone is not compatible with Verizon. Tried 3 times to make sure I didn't type it in wrong, same result. Why is my touch screen not responding well since installing last 2 updates? Is This Normal For The iPhone 7 Plus?